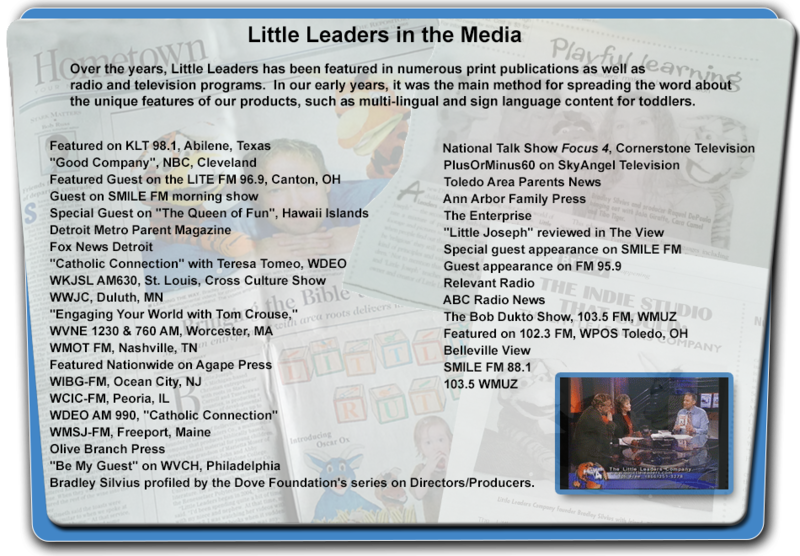 Little Leaders is a family owned and operated company founded in 2004 by Bradley Silvius. We started with a computer, a camera, a sewing machine and a passion for educating and building positive values into the lives of children in their most critical, formative years. Leaders of conviction and integrity are becoming increasingly rare. Simply turn on the evening news or check out the latest story trending online, and you're bound to witness the next scandal that continues to erode the perception of those we once admired. It is more critical than ever that we instill core values and nurture the character of our little ones. After all, they are the ones who can reshape our world. Our mission is simple: To provide faith-based developmental products for young children to help build character and educate the leaders of tomorrow. The market is stuffed with educational material for toddlers. Your choices are virtually unlimited. Little Leaders offers something that we feel is a little different. Our products provide educational content that focuses on character and integrity with a foundation on Old Testament Bible characters. We expose children to the basic Bible stories at their level while using each story to teach real world skills such as recognizing colors, numbers, animals and more, while encouraging positive values such as respect, sharing and honesty. Studies show that the toddler years are the perfect time to expose little ones to the sounds and nuances of multiple languages. Each program in the Little Leaders Video Series comes in English paired with at least 3 other languages! Parenting continues to change, and gone are the days when videos are simply babysitters. Our products are designed to encourage interactivity between child and parent. Each episode of the Little Leaders Video Series contains companion material in American Sign Language designed to provide a quality educational time with your child while helping to build critical motor skill development.